ARMY, rejoice! 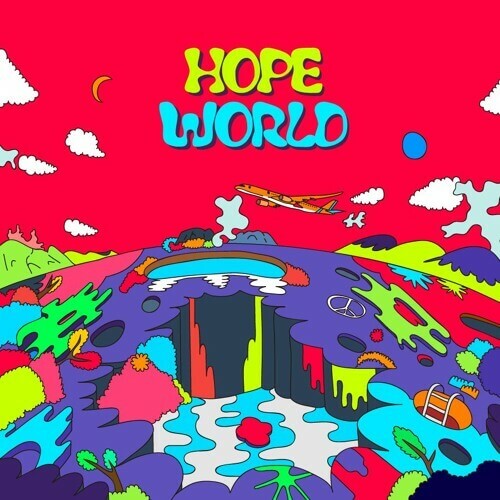 On March 1, or March 2 in Korea, “Hope World” was released by global superstar group BTS’s rapper Jung Hoseok, also known as J-Hope. This mixtape, a solo production separate from the K-Pop group’s work, was affectionately named “Hixtape” by BTS fans (a portmanteau of “mixtape” and “J-Hope”). The mixtape, consisting of seven songs titled “Hope World,” “P.O.P (Piece of Peace) pt.1,” “Daydream,” “Base Line,” “항상 (HANGSANG) Feat. Supreme Boi,” “Airplane,” and “Blue Side (Outro),”. “Daydream” also has a music video, which now has over 21 million views. “Hope World” has already broken records and hit #1 on the iTunes albums chart in over 70 countries upon the week of release. J-Hope is now the KPop soloist with the most #1 hits on iTunes, surpassing records that were previously held by BTS themselves. This comes as a shock to many, especially since the mixtape is available for free listening on BTS’s Soundcloud and has free download links on their official Twitter (which actually crashed due to traffic upon release). Even more shocking, however, is how long the wait for the mixtape was, which was originally hinted at back in 2016. Since then, the production was something that was hinted at by fellow BTS members, BigHit producers PDogg and Supreme Boi, as well as SoundCloud, Spotify, Time Magazine, Billboard and even John Cena, who regularly posted photos of J-Hope on his Instagram prior to the release of “Hope World”. The verses, even through translation, have the same lyrical presence as those in BTS’s well-known metaphorical criticisms. “The daily wage that makes blood and sweat worthless/ An answer like drought that/ Withers even a blossoming sprout/ Even if I shout, sing, it’s like this world is hard of hearing,” J-Hope says in “P.O.P (Piece of Peace) pt.1” (translation by @BTS_Trans on Twitter). Still, it is impossible to have J-Hope without having BTS, and the more chill beats of “Airplane” features their vocals as well. J-Hope is the third member of the group to release individual work, but this doesn’t necessarily mean the end of the group. Whether you speak Korean or not, “Hope World” is something that can resonate within listeners of rap, hip-hop and pop alike.